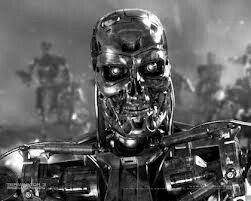 “Barrat believes artificial intelligence is coming, but he thinks it will be more like Skynet. In the Terminator movies, Skynet is an automated defense system that becomes self-aware, decides that human beings are a danger to it, and seeks to destroy us with nuclear weapons and terminator robots. Read the whole thing. The article brings up many issues which I could ( and probably will in future blog posts) talk about extensively. It’s hard to know where to start. Perhaps for now I just should just bring up the first and more immediate objection that strikes me when reading futurist articles like this one. Namely, their use of the word “inevitable”. Of course nothing in the future is “inevitable”. Even entirely natural apocalypses, once predicted, have failed to arrive. But when one applies the word “inevitable” to a man-created apocalypse that depends both on an enormous technological leap and near-universal human complicity, we really have to take a step back and question the fundamental perspective from which the prediction is being made. Of course the word “inevitable” is common parlance in the singularity crowd just as it is in every other prophetic cult. But for now, as long as we are quoting Terminator, we should also recall the most memorable quotation from the franchise: ” No Fate but What We Make”.